Proper pruning, as we are often told, involves removing the 3 D’s from our trees: Dead, Damaged and Diseased wood, so our organic gardening pruning chores revolve around that. Now pruning dead wood that could be a hazard, such as a big branch in a tree that might fall on your neighbor’s cat’s head, is a good idea. If the tree is in a place where it doesn’t pose a hazard, pruning out the dead wood is not necessary, but it’s okay to do if it is unsightly. Damaged branches are a little bit different. If 2 branches are seriously rubbing together, it makes sense to prune one of them out in order to prevent seriously damaging both of them. Proper pruning suggests water sprouts and suckers should be pruned out, too, since they often develop into structurally unsound, unsafe branches in our organic garden. Other damaged branches that still have green leaves, however, are valuable to the plant. The plant may still be photosynthesizing with these leaves and if it is a big branch or series of branches, it could be a big reduction in the plant’s photosynthesizing capacity to prune all of that out. Or the plant may have abandoned photosynthesis, in which case it will pull many of the nutrients from those leaves back into another part of the plant where they can be used. 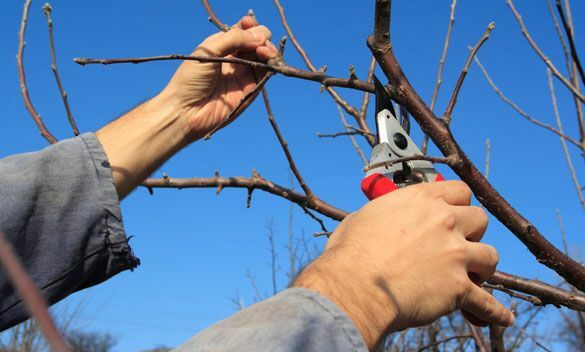 If we prune too early, even if we’re using proper pruning techniques, we are not only creating an open wound, but we are removing many nutrients that still could be used. This is the case even with the small perennials in your organic garden. They may look unsightly when they are dying back, but the longer you leave them, the more nutrients the plant gets to bring back into itself for use in the future. If you need to prune out dead wood, rubbing branches, water sprouts or suckers, make sure to do that while the tree is young. Pruning a branch when it is small is a lot easier on a tree than waiting until it is big. But think twice about pruning out damaged wood. The plant may still need the photosynthesizing capability and nutrients from those leaves. Next I will talk about the most controversial one, Proper Pruning For Disease – How Pruning Out Disease Is Actually Bad For The Plant. I’m a naturopathic doctor and while I hadn’t thought of this before, it makes so much sense to me because it’s exactly the same thing in people. If you’re healthy, disease stays away. If you’re not healthy and disease comes knocking, cutting or burning or drugging it out is not the answer. Thanks. You made a point, Don, that I hadn’t thought of. I prune professionally and I don’t belive in “cut and burn” for people, but never applied that to plants. would it be good to spray your monthly foliar feed on fruit trees and bushes and if so when is the best time. Absolutely. I spray fruit trees and bushes along with everything else, spring through fall. The best is in the morning, second best is evening, or even during the day on a cloudy day. It’s really nice to do it after a rain, or after irrigation.